On December 8, the Macedonian Orthodox Church celebrates the feast day of Saint Clement of Ohrid. As he is the patron saint of Macedonia, Saint Clement of Ohrid Day is one of the country's public holidays. St. Clement was a Bulgarian scholar, writer and enlightener. He was born circa 840 in the region of Kutmichevitsa. Clement was the most prominent disciple of Saint Cyril and Methodius, he took part in their mission to Great Moravia. After Cyril's death Clement accompanied Methodius on his journeys. St. Clement was one of the most important and prolific authors in Old Church Slavonic and the creator of the Ohrid Literary School, a major cultural center of the Bulgarian Empire. He is also credited with the creation of the Cyrillic script based on the Glagolitic alphabet developed by Cyril and Methodius. 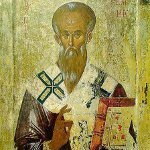 In Bulgaria and Macedonia, St. Clement is venerated as a patron of language and education. Saint Clement of Ohrid Day was first celebrated as a non-working public holiday in 2007. The holiday is marked with various cultural events held throughout the country. On this day, Macedonian citizens with outstanding lifetimes achievements in culture, art or sports are presented the Saint Clement Award.